New features are coming to the Fitbit Versa and Fitbit Ionic, including expanded on-device views of your daily stats, female health tracking, and 10 new third-party apps. 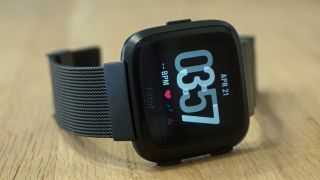 Fitbit OS 3.0 is officially launching today on the two fitness-focused smartwatches, though some apps and features will wait until early 2019, according to Fitbit. The Fitbit ecosystem continues to track more health data on its dashboard than the Apple Watch 4, as it tries to position the Versa and Ionic as rival smartwatches. Here's everything in the new Fitbit OS 3.0 update. The Ionic and Versa are becoming more independent thanks to personal data at-a-glance. You can now access sleep, water intake, and weight from your wearable. Fitbit OS 3.0's on-device dashboard also expands on exercise stats, heart rate, and hourly activity, reducing the need to tap into the smartphone app. Finally, the update introduces new goal-based exercise modes. You can set goals for calories burned, distance or time for more than 15 exercises, including running, biking, and swimming. These goals will include real-time stats, progress, and celebrations. There are plenty of Fitbit-compatible health and fitness apps in the Fitbit App Gallery, but when your watch doesn't support your favorite new app, it can be a downer. Good news, Fitbit is rolling out support for additional apps starting today: achu health, Couch to 5K, Genius Wrist, and MySwimPro. This number will expand to 10 third-party total apps in early 2019, when Fitbit starts supporting Charity Miles, FitBark, Gold's Amp, MindBody, Noonlight, and TRX. Fitbit is opening up its API for advanced developer capabilities, allowing its 44,000-strong dev community to utilize their own algorithms and record custom exercise sessions when building third-party apps. What's planned? So far, Fitbit developers are leveraging the API for ambitious apps like Alpine Snow and Skateboard, options you don't really see among smartwatches. Fitbit will be expand upon the Female Health Tracking section that was first added to the app in March 2018. Its period tracking capabilities are getting a bit more robust. In early 2019, the Fitbit app will allow you to see menstrual cycle data, logged symptoms, and trends, according to Fitbit. The best part is that this feature will be in the Fitbit app, so you don't need a Fitbit OS 3.0 smartwatch to get it. As we approach CES 2019, we may hear more from Fitbit, as it continues to roll out new features to Fitbit OS 3.0 today through early 2019.